When historical romance author Barbara Devlin told me that Amazon was launching it's first ever historical romance Kindle World, I was thrilled. Even better, she then shared the information that the chosen World would be Kathryn LeVeque's medieval de Wolfe family and that Barbara and several other authors had already signed on to write novellas for the launch. I wasn't that familiar with Kindle World so Barbara put me in touch with the de Wolfe's creator, Kathyrn LeVeque. Our Q&A below should answer all your questions about this exciting new project that you can participate in too! Thank you for visiting with us today, Kathryn. I understand you’re about to embark on a new venture with Amazon’s Kindle World. For those of us unfamiliar with this platform, please explain what Kindle World is and how it works. Thank you so much for having me! And I’ll gladly explain Kindle Worlds - Kindle Worlds is a very unique site in the world of fan fiction – Amazon licenses certain series and/or character worlds from some of its most popular authors. Amazon then creates a ‘world’ for that author, providing a platform where fans can write about that author’s characters or series (whatever the World happens to encompass) and get paid for it. The best part? Authors get to see fans creating amazing stories out of their characters, and the fans doing the writing – using already-established characters – make royalties when their books sell. Here’s why Kindle Worlds is such a good idea: For readers who love a particular series and would like to see other characters perhaps breakout into their own stories, it’s a perfect time to give your idea a try. Why not? Every author started out as a reader, so if you’re a reader who would like to see a particular character have his/her own storyline and you already have an idea about it, why not write your own story? If your story sells, you get paid. If you’re already an author but would like to gain more readership by drawing on the readership of a particular Kindle World, then it’s a perfect opportunity to use existing characters and create a storyline around them. that you’ve created and what this partnership with Kindle World means for fans of this popular series. The de Wolfe Pack is based on the House of de Wolfe, which was the basis for the very first novel I ever wrote. 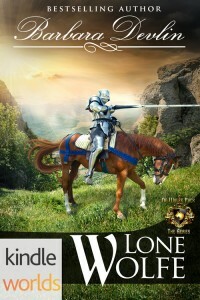 The first book, THE WOLFE, is set in 13th century England along the Scotland/England border. THE WOLFE has turned out to be my most popular novel and there are, so far, five books in the series and growing. This is what Kindle Worlds means to fans of the de Wolfe Pack – well, let’s be honest. I will never be able to write all of the stories I want to write using my de Wolfe family. I have readers ask me constantly about a secondary character having his own story, or maybe a child of de Wolfe having his/her own story. I should live so long to write all of those stories! Therefore, the World of the de Wolfe Pack allows for readers and other authors to write all of those amazing stories I just don’t have the time – or even the imagination – to write. I’m so deeply honored that readers and other authors would care enough about my characters to take the time to write in my world, giving new life to my de Wolfe family. I love to see what someone’s imagination can come up with in putting my de Wolfe family in a different place and time. Will other authors be participating in the launch? Who are they and what will their participation entail? Eliza Knight, Anna Markland, Violetta Rand, Lana Williams, Elizabeth Rose, Victoria Vane, Victoria Zak, Barbara Devlin, Hildie McQueen, Catherine Kean, Christina McKnight, Amanda Mariel, Christy English, Scarlett Cole, and Meara Platt. If you’ve not read these ladies yet, I would strongly encourage you to do so. Each one of them is a spectacular writer. Will your Kindle World be open-ended or for a finite period of time? The World of de Wolfe Pack will be up and running for ten years. Ten years of great stories! How can readers participate? Will we be able to submit stories? Purchase stories? Readers can absolutely submit their own stories! I would encourage them to do so! And, yes, you will be able to purchase stories from all of the authors I listed PLUS more to come! I will be encouraging and asking authors and readers to submit stories to my World for years to come, so there will always be something new and great to read about the de Wolfe Pack. It seems like I’m always working on something - this brain never stops! Currently, I’m working on my December release called DARK DESTROYER, which is also a de Wolfe Pack novel. After that, I’ve got nine novels and two new collections slated for 2016. Busy, busy! At my website at www.kathrynleveque.com, on Facebook at Kathryn Le Veque, Author, and on Twitter @kathrynleveque. There are also at least three fan-run sites on Pinterest that I’m aware of, including a de Wolfe Pack Kindle Worlds Pinterest page with some beautiful cover art on it. I’m always very happy to hear from readers and try to respond to everyone. Thank you so much for answering my questions, Kathryn. Is there anything you’d like to add? Thank you so much for having me today and thank you for your interest in the World of de Wolfe Pack and the authors helping launch it. The Indie community of authors is such a great group of women and I am very happy to call many of them friend. Most importantly, I always want to give a shout-out to the readers who make all things possible for authors like me. Without you, there would be no me – I say that many times, but it’s true. I have great respect and appreciation for my readers and I try my best to keep them happy! Would you like to ask the readers a question today? Sure! I’d like to know (other than Medieval Romance – heh!) what their favorite genres are and what genre, if any, would they like to see me write in. I’m always open to suggestions! Thank you again for having me – it was a pleasure! Here are a few of the other authors, including Barbara Devlin, who are participating in the World of de Wolfe Pack launch. Trouble follows Brogan Hage into Silver City, Idaho, when injuries force him to seek medical attention. An unexpected offer has him thinking about settling in the bustling town. Between outlaws showing up and a beautiful passionate woman, the hardened lawman is not sure which is more dangerous. Town doctor's daughter, Sarah Sutherland, finds herself fiercely attracted to the wounded U.S. Marshal in her care. The fact he has a reputation for ruthlessness does not stop her from falling in love. What happens with a young woman's first love is a hardened man? Whatever makes YOU happy. If you're happy, then we're happy! I do love historical reads. Just travel through history and I'll be pleased. PJ, thank you for the lovely spotlight. It was such an honor to be asked to write a book for the launch, and I am even more grateful for the opportunity to work with such fabulous authors. Dishes, I hope you give our books a chance, because we worked very hard on our installments in the series, and there is something for everyone. Do you like chivalrous knights? We got 'em. Fiery Vikings? Check. Hot cowboys? Yes, ma'am. Courageous SEALs? Oh, yeah. So the only difficult choice is which one to read first. Enjoy! So proud to be part of this amazing new venture! 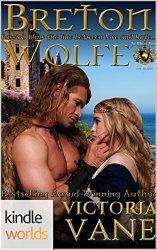 World of the Wolfe truly does have something for all romance readers! Thanks so much for helping us spread the word, Dishes! This was a fabulous collaboration that I think readers are really going to enjoy! I loved being part of it! It has been a wonderful adventure to write in Kathryn's World. I've read 2 so far! Looking forward to reading all the books in the World of de Wolfe! I have downloaded many of them to my Kindle. Looking forward to diving in! Thank you for sharing your writing talents with us, ladies! I enjoy the Regency & Victorian Eras, but I wish an author would try setting a story in the Gilded Age. It's a fascinating time period in America's history. Historicals have always been my favorite. Maybe a mixed genre such as historical fantasy but I love variety so I'm open to almost anything. Kindle World is an intriguing concept! I need to find out more about it. I enjoy historical romances, especially those that take place in the Regency, Medieval, and old American West periods. What a great interview, Kathryn! It has been such a joy to be involved in the De Wolfe World! I'm so happy to have someone writing about this time period!!! Love the concept. A whole new world has opened up and I look forward to reading so many of the books. They sound so interesting. Thanks for such a fun post! This "world" sounds awesome ;) I'm all about being a passenger. I go where and when the author takes me, they drive! I read! Thanks for sahring! This sounds like a wonderful set of books and an awesome project to be involved in! I love to read about most time periods, so this is perfect being able to following the family through time! Medieval stories were the first romances I read and are still a favorites. Westerns share that favorite spot. I don't have room on all mine on my book shelves. A kindle or oyjrt trading device makes it to indulge without feeling guilty. Besides Medieval Romance, I love Historical Romance / Time Travel/ Paranormal. I think it would be pretty cool to see you write a Medieval Romance with Time Travel. I look forward to reading all the books in the de Wolfe World. It may take me a bit, but I will do it. You ladies rock! I love the Wolfe and couldn't be happier to see spin off stories using such a strong and powerful family. I have read and reviewed three so far and none of them was a disappointment. Looking forward to reading more and browsing through more great stories, some from my favorite authors. So people get writing! Historical is my favorite romance sub-genre. Thanks for a great post and giveaway. I love historical romance. Thanks for the interesting post and giveaway! I have read the books that started it all, and loved them Now I want to read all these that will connect with them . . My poor one click finger will get worn out. What a wonderful idea! I was a bit hesitant about the idea at first but the more I read about it the more the more it sounds appealing. I love all kinds of historicals as well as paranormal romance. Medieval romances were the first I read and are still a favorite. This is a wonderful collection of stories and authors. I look forward to reading all the books.